Passionflower | Herbal Remedies | Andrew Weil, M.D. Passionflower is a perennial climbing vine native to the southeastern United States, but also grown extensively in Europe. It can grow as high as 32 feet, has bluish-white petals, and produces egg-sized fruits referred to as a maypop. The dried, above-ground parts of the plants – the leaves, stems, and flowers – have a long tradition of use in herbal medicine their for calming effects. Passionflower is also known as apricot vine, corona de cristo, maracuja, purple passionflower, and passion vine. It has been said that passionflower got its name when the first Christian missionaries landed in South America during the 16th century. They found that various parts of the flower symbolized elements of the death of Christ. For example, the pointed leaf-tips represented the holy lance, the tendrils represented the whips used on Christ, the 10 petals represented the 10 faithful apostles (excluding St. Peter the denier and Judus the betrayer) and so on. They took these symbols as signs that their exploration had divine approval. Passionflower is used for stress reduction, calming without sedation, and overcoming insomnia when combined with other calming herbs such as valerian and lemon balm. Studies suggest that passionflower may reduce anxiety in patients undergoing surgery. Another study found that passionflower had similar affects as an anti-anxiety medication in reducing general anxiety. The properties in passionflower are thought to promote calming effects by increasing the levels of the chemical gamma-aminobutyric acid (GABA), which reduces the activity of some neurons that cause anxiety. Because of its potential to lower anxiety, passionflower may also be helpful for conditions that are aggravated by stress such as hypertension, asthma, and some gastrointestinal ailments. 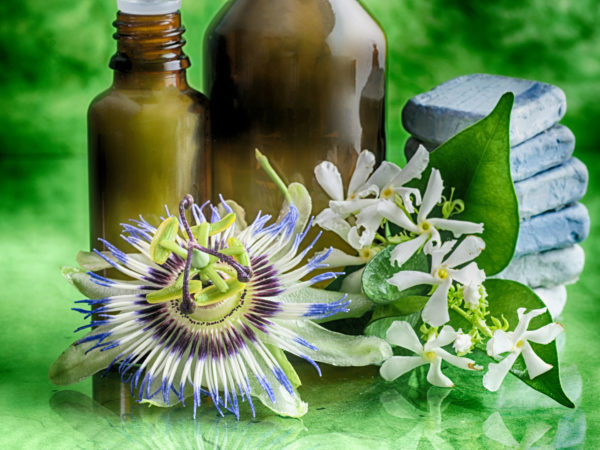 Some research shows that passionflower extract is comparable to oxazepam – a widely prescribed pharmaceutical anti-anxiety agent – for treating symptoms of generalized anxiety disorder (GAD) in some patients. Other research shows passionflower extract in combination with clonidine – a drug commonly used to treat high blood pressure and anxiety disorders – improves the effectiveness of clonidine for reducing symptoms of opiate drug withdrawal including anxiety, irritability, agitation, and insomnia. Passionflower tea has been shown to improve sleep quality when taken an hour before going to bed. As a topical application, passionflower is used in bath preparations as a calming agent for hemorrhoids, burns, and inflammation. 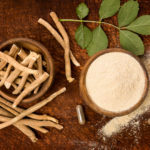 The Natural Medicines Comprehensive Database (NMCD) concludes it is “possibly effective” for treating anxiety and relieving symptoms related to narcotic drug withdrawal. Passionflower is available in tinctures, liquid extracts, infusions, and teas. The NMCD concludes passionflower is “possibly safe” when taken for less than two months as medicine or tea. However, since passionflower has sedating properties, users should exercise caution when taking with alcohol or sedative medications. These include: benzodiazepines and tricyclic anti-depressants, anticonvulsants, and barbiturates. Other side effects of taking passionflower orally include dizziness, confusion, ataxia (involuntary muscle movement and loss of coordination), and sedation. Passionflower may cause dangerous side effects when taken with blood-thinner medications and an older class of antidepressant medication called monoamine oxidase inhibitors (MAOs). Because passionflower may help lower blood pressure, caution is advised when using this herb with antihypertensive medications. Pregnant women should not take passionflower, as the active compounds can stimulate uterine contractions. There is insufficient information available regarding the effects of passionflower in women who are breastfeeding; they should avoid passionflower as well. Choose standardized whole plant extracts or capsules containing no less than 0.8% flavonoids or isovitexin. Tea: passionflower tea an hour before bedtime is commonly used in improving sleep quality. The typical dose is 0.25 to two grams of dried herb steeped in 150 ml of boiling water for 10-15 minutes. For generalized anxiety disorder, 45 drops of passionflower liquid extract taken daily or a specific tablet formulation of 90 mg per day has been used effectively. For topical use as a hemorrhoid rinse, 20 grams of dried above ground parts of the herb simmered in 200 ml water, strained and cooled before application. For children, consult a pediatrician before use. I highly recommend that you consider passionflower instead of taking a synthetic drug or using alcohol or food to self-medicate when you are experiencing stress. It is calming without being sedating, and much safer than many of the popular anti-anxiety medications used today. Akhondzadeh, Shahin, H. R. Naghavi, M. Vazirian, A. Shayeganpour, H. Rashidi, and M. Khani. “Passionflower in the treatment of generalized anxiety: a pilot double‐blind randomized controlled trial with oxazepam.”Journal of Clinical Pharmacy and Therapeutics 26, no. 5 (2001): 363-367. Movafegh, Ali, Reza Alizadeh, Fatimah Hajimohamadi, Fatimah Esfehani, and Mohmad Nejatfar. “Preoperative oral Passiflora incarnata reduces anxiety in ambulatory surgery patients: a double-blind, placebo-controlled study.” Anesthesia & Analgesia 106, no. 6 (2008): 1728-1732. Passionflower. Natural Medicines Comprehensive Database. Stockton, CA: Therapeutic Research Faculty. [Updated March 3, 2014; Reviewed March 3, 2014; Accessed April 4, 2014].